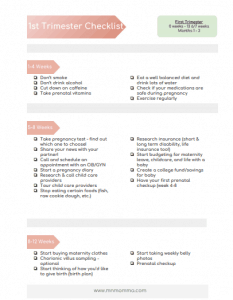 Your pregnancy to do list can easily be broken down into trimesters and even into a pregnancy week by week guide! 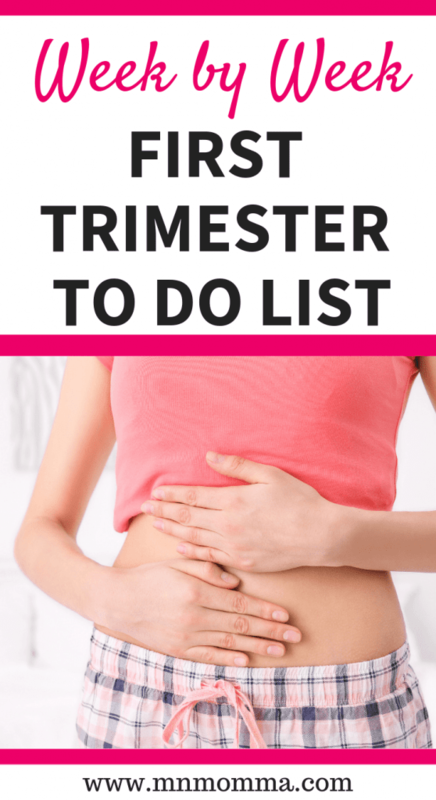 These easy tips will help you figure out what you should be doing and expecting each week of your pregnancy so it doesn’t start to feel overwhelming. 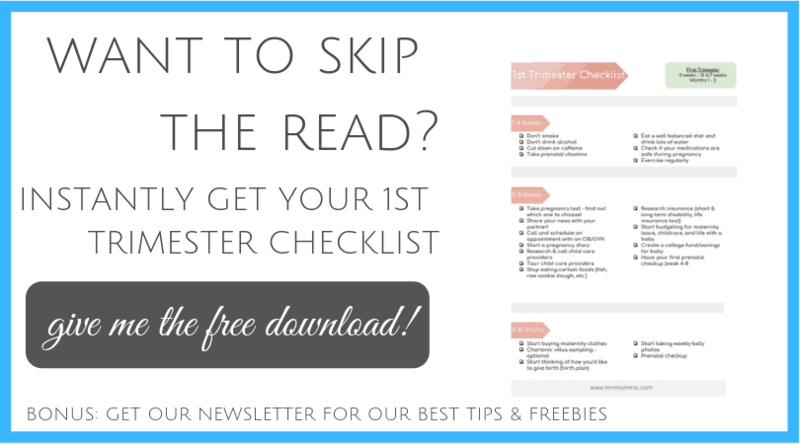 Grab your free pregnancy checklist: first trimester, to easily download your own copy and keep your pregnancy list on track! Ready for trimester 2? 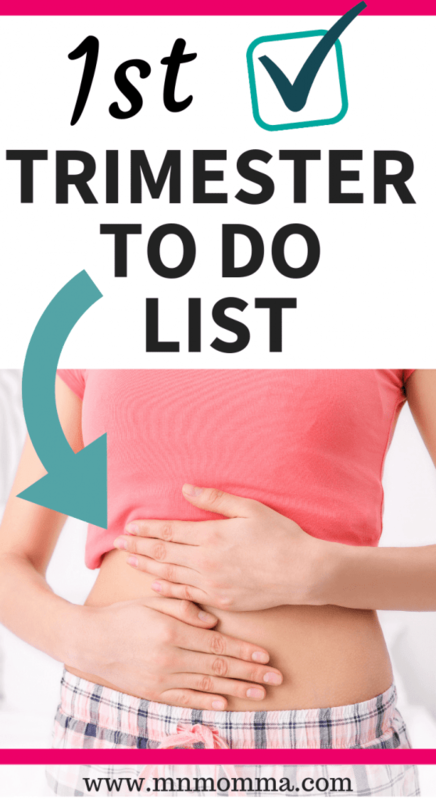 Check out your weekly to do list for the 2nd trimester! Smoking while pregnant can cause harm to you and your unborn baby. If you’re a smoker, now is a great time to reach out for help and try to quit. Alcohol, especially during the first trimester, can cause birth defects for your baby. While some studies show that a glass of wine every once in a while is okay, many doctors agree that no amount of alcohol during pregnancy is considered safe. Cutting down on caffeine during pregnancy is important. While it’s still okay to have your cup of coffee during the day, you probably shouldn’t be drinking 5 cups a day or having an energy drink. Caffeine has been linked to miscarriage in some studies, while others have shown that small amounts of caffeine are okay. Due to these conflicting studies, experts recommend that women try to cut back and limit caffeine to 200mg or less a day. Taking prenatal vitamins while pregnant is a must. If you start taking them before your pregnant, even better! Prenatal vitamins typically have more folic acid and iron in them than regular vitamins. They also may contain omega-3s which studies have shown may help with baby’s brain development. These are currently my favorite prenatal vitamins – the fact that they’re delicious is an added bonus! Now is a great time to be sure you’re eating a colorful plate of healthy foods! The nutrients you ingest are transferred to your baby. Your body is working hard making a baby and needs all the best pregnancy super foods it can while pregnant. You should also be sure to drink lots of water during pregnancy and starting right away is a good habit. Some women may experience dizziness and lightheadedness during pregnancy – drinking lots of water and staying hydrated is a good way to help combat this. If you’ve read my other posts you’ll know that I highly recommend a large water bottle like this one. Simply put, some medications are not safe during pregnancy. Certain medications can cross the placenta to your baby and has the potential to cause harm. Whether you were trying to get pregnant or are unexpectedly pregnant, you should be sure to check with your doctor about the medications you’re taking and find safe alternatives if possible. Exercising during pregnancy is so important. Did you know that it can actually lead to an easier labor and delivery experience? If that’s not motivating, I don’t know what is! Exercise during pregnancy can also help you feel more energized, help you sleep better at night, and help you maintain a healthy weight gain during pregnancy. 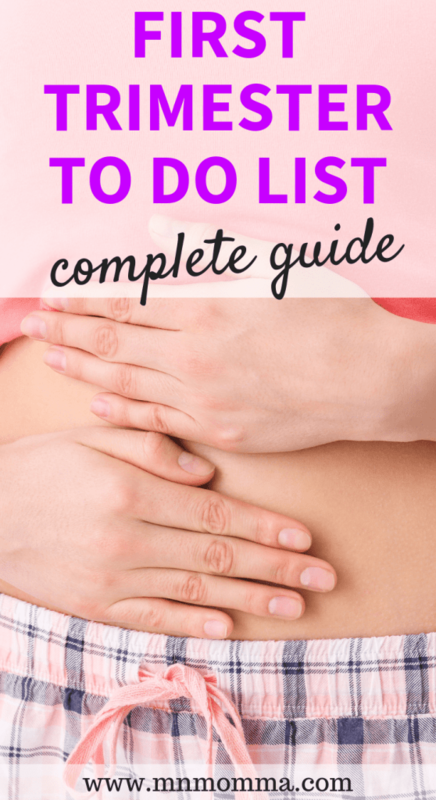 If you’re looking for a great (and safe) pregnancy workout plan and healthy eating guide – the Belly Only Pregnancy is for you. There’s also a great, easy to use app that goes with it! Otherwise if you find you’re struggling to get motivated check out my post How to Exercise While Pregnant, When You’re Exhausted. Now that you’re finally far enough along to have your pregnancy show up on an at home pregnancy test, it’s time to take one. If you take more than one to confirm your pregnancy, don’t worry, you’re not alone! Make sure you know how to read your pregnancy test and follow the instructions for how to use it. While you certainly don’t need to buy the most expensive pregnancy test (pssst – I’ve used $1 tests successfully before! ), you do need to be sure you choose a good pregnancy test. 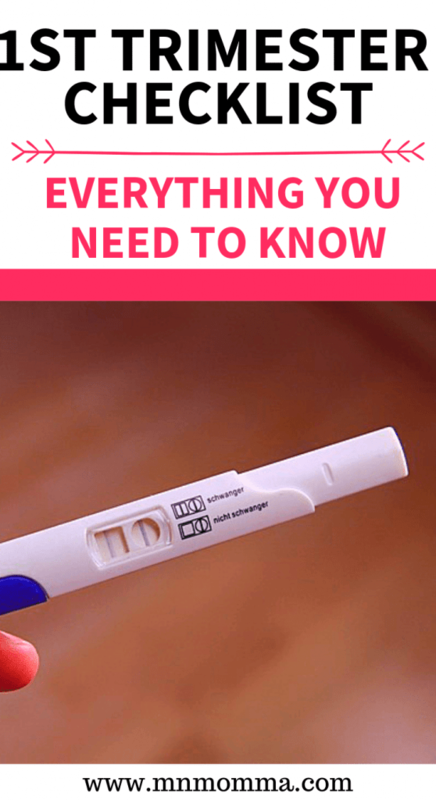 This article, How to Choose the Right Pregnancy Test, will help you learn all the ins and outs of at home pregnancy tests. Share your news with your partner! Congratulations on your positive pregnancy test! Now it’s time to share the news with your significant other. If you took the test with him in the room, the waiting time to share the news will be pretty short. However, if he’s at work or doesn’t know yet, you can have some fun and tell him in a fun way – or call and blurt out your exciting news right away. The choice is yours momma! Calling to schedule your first prenatal appointment makes the whole thing seem super real. If you don’t know which doctor or practitioner you want to see, do your research. Ask friends and family, read about their background, or do interviews. You can always switch if you chose someone you end up not liking. When you call to make your appointment, try to remember the first day of your last period. The receptionist or nurse will help you figure out how far along you are and let you know when to schedule your first appointment, along with what to expect. Maybe this will be your only pregnancy, or maybe you’ll have 10 babies. Either way, it can be fun to document this exciting part of your life with a pregnancy diary or journal. You can either buy one of these adorable ones that give you prompts and spaces to write about milestones, or you can create your own with a cute notebook. While you may not think you’ll look back on it, during your next pregnancy or when your little one is older, it can be fun to see what was happening during your pregnancy and how you felt. Call, call, call! If you’re planning to send your child to daycare or have a nanny, it’s so important to start researching and interviewing child care options as soon as possible. 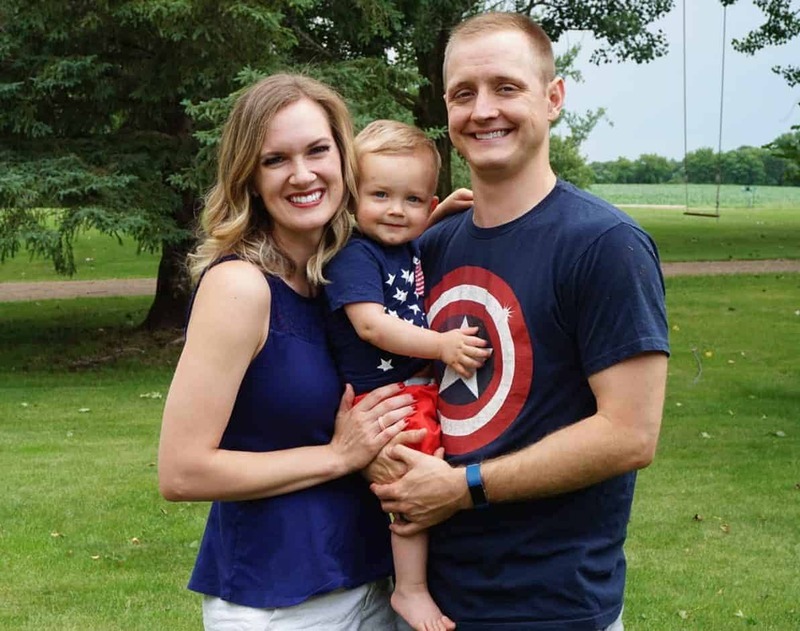 Many places have wait lists and are especially hard to get a newborn into due to state restrictions on the number of newborns allowed in a childcare setting. Make sure you research your provider and feel comfortable with him or her watching your child. Touring your childcare provider is a must. There are some great lists of interview questions to also ask while you’re visiting. You want to be sure your baby will be in a safe, clean, and caring environment – or you won’t be happy. If you’re not comfortable with someone, don’t be afraid to say it’s not a good fit and find someone new. Oh, pregnancy rules. Now that you’re pregnant there are certain foods you need to avoid. Say goodbye to uncooked sushi, deli meats, and raw cookie dough! Did you know you should even avoid homemade ice cream? You may not have ever needed to know the ins and outs of your health insurance, but now is the time to learn. Look at your policy to see what’s covered under your insurance. Most insurance providers cover all your prenatal visits at no cost to you, due to it being considered “preventive care”. However, if you’re working with an infertility specialist – things may be coded differently and you might end up paying more than you expect. Don’t be afraid to ask your doctor and call your insurance provider to get to the bottom of what’s covered by insurance and what’s not. You’ll also want to look at your deductible and out of pocket max to learn what to expect when it comes to paying for your baby’s delivery. I’d love to give you an average cost for delivering your baby, but it ranges greatly – from some moms paying only $50 (great insurance!) to others paying thousands of dollars. Also, don’t forget to ask about adding your new baby to your insurance! If you’re already on a family plan things may not change a lot, but if you’re switching to one (which you can do because having a baby is considered a qualifying event!) you’ll want to be sure you know the plan’s details. Short and long term disability is something else to check into. Moms on maternity leave can qualify for short term disability. Depending on your insurance, you will likely already have to have the insurance before getting pregnant to qualify for the benefits. This can be a great perk to supplementing your income during maternity leave if you decide to get it. However, keep in mind your employer may not offer it and it may be an insurance premium paid out of your own pocket. Life insurance is another option to look into when you’re adding a new baby to your family. Weigh the pros and cons, including the cost to see if it’s worth it for your family. There are some financial changes you should expect once you get pregnant. You’ll need to start budgeting for baby products (grab the baby essentials list here), childcare costs, and life with an added person in it – food, clothes, etc. This can change some family budgets drastically, while it may not really affect others. If you’re used to spending everything and not saving, it may be time to focus on saving more and adjusting your lifestyle so it’s not as much of a shock once baby’s born. Consider starting a college fund and savings plan for your new baby. College costs are expected to continue to increase and putting some money away now (and letting it build!) can make a big difference 18 years from now. Make sure you check into all the details as well. Many college funds allow for the beneficiary to be changed if your child decides to forgo college or if they get a scholarship. As far as a savings plan goes, your baby might get money for his or her birthday or baptism that you’re not sure what to do with. Starting a savings account for baby can be a great place to keep this money safe and accessible for when your child is older. If you know your child won’t be using it for awhile, consider other investment opportunities like a CD. Yay, your first prenatal checkup! Some doctors will wait to see you until you’re between 8 and 12 weeks, so don’t panic if it’s not your turn quite yet. If you do have an appointment, your doctor may give you an ultrasound or attempt to listen for your baby’s heartbeat. Depending on how far along you are, you might not be able to hear the heartbeat just yet, but will tell you what to expect and give you great information for a healthy pregnancy. Many women’s bodies are starting to change already. It might be time to invest in some great maternity clothes. Whether it’s just a maternity tank top or bra, or a whole new outfit, follow your body’s lead and wear things that are comfortable. Depending on your wardrobe, there’s a good change you can make many of the clothes you already own work for a while during pregnancy. This can save you money as well! That being said, you now have an excuse to buy a cute new outfit. Keep in mind that your body will keep changing over the coming months so make sure you don’t buy everything now! Tip: Belly bands are a great way to expand your wardrobe for pregnancy. So grab a few of these and help your pants last a few weeks longer and be a little more comfortable. Chorionic villus sampling is a prenatal test that gives information about your baby’s genetic makeup. There are some risk factors as well – so be sure you talk with your doctor about the best plan for you and your baby. All natural? Epidural? Water birth? Do you want your whole family in the room or just your husband? Do you have a plan in your mind already for how you want to give birth? If not, that’s totally okay – you have time! However, it’s a great time to start researching and forming ideas for how you want your birth to go. You can just talk with your doctor about this, or create a formal written birth plan to share with your provider. Keep in mind that babies can be unpredictable and birth plans can’t always be followed perfectly. Is your belly growing yet? If not, you’ll probably start to show soon – even if you’re the only one who can notice it. It’s a great time to start taking weekly belly photos to watch how you and your baby are changing and growing! Looking back at these was something I loved after my son was born. Try to take your pictures in the same location and same pose weekly to be as consistent as you can. Some moms even like to wear the same tank top to really focus on the belly growth from week to week. If you haven’t had your prenatal checkup yet, it’s finally time! Your doctor will try to listen for your baby’s heartbeat and you may get an ultrasound if it’s your first appointment. Typically you’ll have an appointment every 4 weeks from here on out – at least until you’re closer to the end of your pregnancy. Don’t be afraid to add your own things to this to do list – like relax! It’s a necessity for expecting moms, your body is working hard. Remember to take good care of yourself and listen to your body. It’s important to make it to your prenatal visits and discuss any concerns you have with your provider – it’s their job to help you and take care of you and your baby! 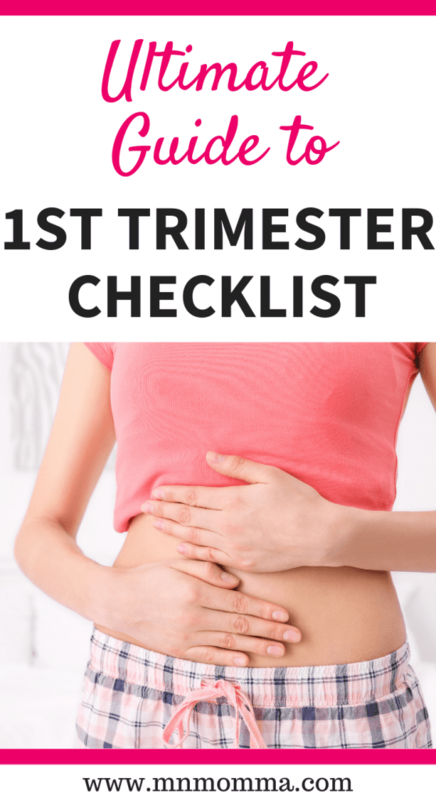 If you haven’t already downloaded your free pregnancy checklist for first trimester – you can get it here – along with checklists for the second and third trimester!